Boxcutters, Citrus Juicer, Strainer, Tablespoons, Flûte. 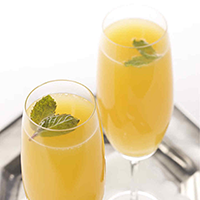 In a Champagne flute, mix together orange juice, lemon juice, and liqueur. Fill with Prosecco. Garnish with mint leaf and serve immediately.